Posted on Thu, Feb 2, 2012 : 5:58 a.m.
111 North Ashley - formerly Ashley Terrace - has recently been rebranded by the building's new owners. Downtown Ann Arbor’s Ashley Terrace high-rise has a new name — part of an effort to rebrand the 10-story complex after it fell into foreclosure and changed ownership in 2011. The building, now called 111 North Ashley, has undergone exterior renovations as part of the new owner’s attempt to rebrand the high-rise, which was sold in summer 2011 after falling into foreclosure earlier in the year. The Bloomfield Hills-based owner, Alidade Capital Fund LP, has launched a new marketing campaign and is confident about the building’s future. In 2012, the company hopes to lease more than 20,000 square feet of vacant retail and office space in the facility and sell its remaining condominium units. 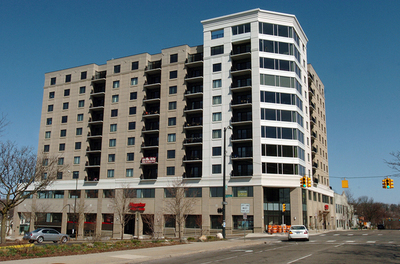 The 10-story, 99-unit Ashley Terrace, situated on the northwest corner of West Huron and North Ashley, opened in 2008 after two years of construction. The building includes underground parking for the residential condominiums. Chicago-based developer Joseph Freed & Associates proposed the high-rise as part of a building boom following intense developer interest in downtown Ann Arbor. Freed also developed Ann Arbor’s 4-Eleven Lofts, which opened in 2009. That building has since been sold to Houston-based The Dinerstein Companies. 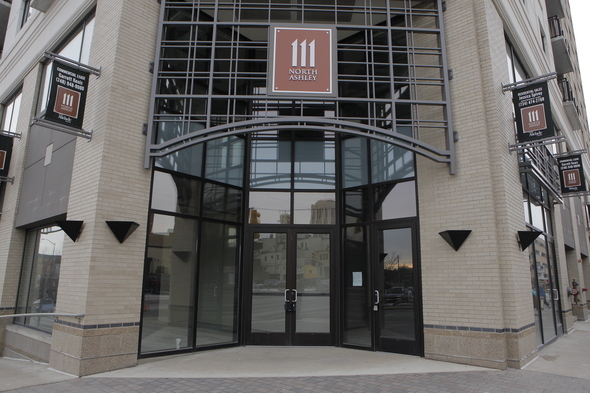 The 111 North Ashley building is located on the northwest corner of West Huron and North Ashley in downtown Ann Arbor. As the economy collapsed, lender Bank of America started foreclosure proceedings against Ashley Terrace in spring 2010. When the foreclosure was filed, the outstanding debt on the property was $20 million, according to county records. Alidade Capital then bought the building - with 29 unsold condos and more than 20,000 square feet of vacant retail and office space - from BOA for approximately $6 million. As part of the recent rebranding, Alidade changed the building’s name, installed new decorative awnings and banners, updated the lighting and placed TVs in the windows to market the space. Geoff Langdon, managing partner of Alidade, said the company was not actively trying to fill the vacant retail and office space during the renovations. then go to the market,” he said. The original plan for the building was to have 10,000 square feet of street-level retail space and 16,500 square feet of second-floor offices. But the only tenant that has signed a lease for the space is Flagstar Bank, which took 5,500 square feet. Along with lowering the rental rate, Langdon said Alidade is being flexible about the type of uses for the space. “We’re looking at potential retail users on the first floor and also looking at a pseudo-retail user: somebody that has an office component, but likes to have visuals on the first-level, like a real estate or title company,” he said. A corporate user that would be interested in occupying part of the first floor and the second floor - which could be connected by a stairway - would also be a possibility, he said. The space is being marketed by Signature Associates for an annual $22.50 per square foot. Langdon said Alidade has, in fact, turned tenants away in the past six months, including one who wanted 10,000 square feet and some smaller retailers. Although there is parking on the property for the residential condos, it doesn’t include spots for the commercial and retail users, potentially turning away tenants that demand parking. To help counter that issue, Langdon said Alidade recently secured approximately 30 parking spaces in the city-owned Ann & Ashley lot and is on the waitlist for more. The condo units in 111 North Ashley range in price, but Langdon said the low-end is approximately $274,000, well above the average price of condos in Ann Arbor. In 2011, the average listing price for condos in Ann Arbor was $173,173, according to a report by the Ann Arbor Area Board of Realtors. The average sale price was $150,284. Since Alidade bought 111 North Ashley, five additional units have sold, and the remaining 24 are being leased or used as staged units. Real Estate One is marketing the unsold units. A rental listing for a 990-square-foot, one-bedroom condo markets it for $1,850 per month. A two-bedroom, 1,500-square-foot model is listed for $2,700. The company's faith in the condo market stands in contrast to others who seem to have lost faith. For example, in August, a group of investors sold the 233 apartment units at Ann Arbor's Woodland Mews development south of downtown for a rumored profit of $8.5 million just eight months after they bought it. When Woodland Mews was originally constructed, developers wanted to turn the rental units into condos. But only 73 have been sold — and the new owners have no plans to convert the apartments into condos. Langdon said Alidade doesn’t feel pressured to sell the remaining 111 North Ashley condo units immediately. He said most of the units are owner-occupied and the building attracts a range of tenants. “We really have this two sort of demographic fit: Younger couples that do very well or older couples that have done very well in life and are now just enjoying the downtown environment,” he said. Fri, Feb 3, 2012 : 5:41 p.m.
Everyone, one element I think is appropriate to mention is that the average listing price for 111 North Ashley price is high compared to the average listing price for Washtenaw County condos — but it's not high compared to the average listing price for other downtown condos. For example, at the Liberty Lofts development on the west side of downtown, an 844-square-foot unit is currently listed for $310,000, while a 1,369-square-foot unit is listed for $359,000. At the Ashley Mews development, a 2,900-square-foot unit is listed for $629,000. I hope this helps provide some additional clarity on the market for downtown condos. Fri, Feb 3, 2012 : 9:37 p.m.
Actual recent selling prices for units in those developments would be more instructive. A seller can list a residence for whatever price they want, but it may never sell for that amount. A large, OWS home near where I live, that has been on the market continuously for the past 5 years, was recently sold - but only after the seller reduced the price a couple of times, and negotiated with the buyer on other issues, as well. Thu, Feb 2, 2012 : 9:52 p.m. It's interesting to know that 70 of the 99 condos sold before the place was sold. That's a much higher number than many commenters here have assumed. Thu, Feb 2, 2012 : 8:08 p.m. The most notable trait of this address is that used to be the site of the Wiffletree, which before that was the Fifth Dimension Club. The Who, Jimi Hendrix &amp; the Yardbirds all played there before it closed in 1968?. I believe before that it was bowling alley. This building stands in stark contrast to the values of the Fifth Dimension Club's youth era. People who once cared about aesthetics, culture and art, now all seem greedy, tasteless and selfish. Just another empty, overpriced shoebox on it's end. Fri, Feb 3, 2012 : 12:55 a.m. Yes, I too remember when Ann Arbor was Cool. Thanks for dragging me into the Way-back Machine ! Thu, Feb 2, 2012 : 6:40 p.m. The building has a very unegaging street-level presence. A different ground level design to make it more approachable and desirable to walk by it could have turned it into a bridge between the neighborhoods and the downtown, helping to tie those two areas together. Instead, it just feels like a big hulking mound of bricks. Thu, Feb 2, 2012 : 6:27 p.m. I always thought this was a Hampton Inn! Thu, Feb 2, 2012 : 5:58 p.m.
&quot;Rebranding&quot;? I know what it is but every time I hear about the brand, branding, rebranding these days it makes me cringe. I guess it's a kinder sounding euphemism for remodeling, retooling, redoing, rethinking, retrofitting, regurgitating and just plain starting all over again. A few years ago I'd hear the term &quot;rebranding&quot; and think of a horse or cow that got away. Thu, Feb 2, 2012 : 5:12 p.m.
Thu, Feb 2, 2012 : 7:07 p.m.
Haha! Right? The vaunted OWS looks like nothing so much as the uglier residential neighborhoods of Chicago or Detroit. Thu, Feb 2, 2012 : 6:44 p.m. It's not that it looks &quot;nothing like&quot; X, it's that the thing it does look like is a shoddily put together low-rent housing project circa 1974. Maybe it's just lovely inside, who knows, but it hardly seems from the outside like anything but nasty. Thu, Feb 2, 2012 : 6:17 p.m. It looks a lot nicer than the Tower Plaza monolith, but since that's been there since 1969, I suppose it qualifies as &quot;part of Ann Arbor's local character&quot; now. I agree. It's an urban building and not an ugly one. Statements like &quot;Ann Arbor people prefer character&quot; (and this statement about old west side residents) are oversimplifying for emotional purposes (usually some kind of anger or snobbery). We have a lot more complexity than that in Ann Arbor and it would be great if we liked that complexity rather than judged it. Thu, Feb 2, 2012 : 4:36 p.m.
Love the phrase &quot;we looked at what the market can support and priced it.&quot; Ugh. Thu, Feb 2, 2012 : 4:04 p.m.
Veracity makes the point that the Planning Commission and City Council have felt themselves legally restrained from rejecting a half-baked project on the grounds that it was likely to fail. Assuming they are right about the law, how about still offering an economic analysis of the prospects for success of a particular project and requiring the developer to share it with any and all of its potential lenders? If a sophisticated anaylsis is too much, how about just compiling a (sorry) history of all the downtown projects that have defaulted on their backers--Tally Hall, Ann Arbor Inn, the original Campus Inn, etc., etc. Developers obviously know that Bank of America will lend to anyone with a good Power Point--after all, they even bought Countrywide whose actual and potential liabilities run into the billions. If Ann Arbor can use one more of something--office building, student apartment building, apartments for professionals--we always seem to have multiple developers moving in to fill that same need, and the results are predictable. Fri, Feb 3, 2012 : 4:54 a.m.
Thu, Feb 2, 2012 : 3:31 p.m.
Thu, Feb 2, 2012 : 2:58 p.m.
Thu, Feb 2, 2012 : 2:52 p.m. If they put bars on the windows, it would look like a prison, except for the white part right on the corner of Ashley, and Huron,, which makes it look like someone started to build a nice building, and then ran out of money, so they finished one corner and left the rest for later. Thu, Feb 2, 2012 : 2:45 p.m.
Thu, Feb 2, 2012 : 2:38 p.m. I think it goes just great with the fugly City Hall/Justice Center/Whatever building. Thu, Feb 2, 2012 : 3:18 p.m. Though neither of them are anything to write home about, City Hall pushes the boundaries of contemporary urban architecture (not necessarily a bad thing), while 111 North Ashley is so last-century-suburban-two-tone-brown, I wouldn't put them in the same category. Thu, Feb 2, 2012 : 2:35 p.m. The city Planning Commission and then City Council approved this disaster but will tell you that they had no legal choice. City Council is not allowed to consider either the finances of a developer nor the design aesthetics (or lack thereof). The high cost of construction prevented the developer from selling condos or renting apartments at prices and rates that were acceptable within the community. The secondary purchasers of these properties have a better chance of success because their cost basis is so much lower. The glut of recent premium student residential construction will challenge the student rental market. Hopefully, demand will match supply and these ventures will be successful. Otherwise the Ashley Terrace pattern of bankruptcy will expand. Thu, Feb 2, 2012 : 2:32 p.m.
Uggh. Still one of the ugliest, least inviting buildings imaginable. It's like it is saying 'Please, walk right on by. Don't bother coming in.' The entrance is a masterpiece of the Keep Out, Beware of Architect, Post- Common Sense school of design. Thu, Feb 2, 2012 : 2:08 p.m. I like the building. Don't consider it an eye sore at all. Like Rusty, I'd happily rent or buy one of the units, except the prices are way out of whack with the area. Thu, Feb 2, 2012 : 8:21 p.m. There have been uglier buildings that people have lived in. Besides, I imagine you'd spend more time inside your unit than 'marveling' at the exterior decorations. As long as the interior is quality and the price is right, what's the big deal? Thu, Feb 2, 2012 : 6:20 p.m.
@David: When I think &quot;army barracks,&quot; I picture single-story frame structures, like the ones the old west siders love so much. Thu, Feb 2, 2012 : 2:56 p.m. I agree it's a bad picture. I at least don't get a barracks vibe from the actual building. The ground floor retail space was always destined to be a problem though. It's too far off the foot path for most retail use. The new investor will have to get really creative to fill that well, but here's hoping. Thu, Feb 2, 2012 : 2:29 p.m. I don't know, Kara, when I look at the left side of the picture, all I see is Suburban Army Barracks. I think the architects could have done a little better job than they did. It's a done deal, though, so, like I said, I'm just glad it's in the hands of a Michigan investor, and I wish them well! Thu, Feb 2, 2012 : 1:52 p.m.
Ashley Terrace should serve the community as a grim reminder of what happens when you put short term profits in front of quality of life. May city counsel marvel at the behemoth for years to come and think about sustainable growth. Thu, Feb 2, 2012 : 1:26 p.m. While I agree that the building is aesthetically displeasing, I do applaud Alidade Capital as an instate investor for taking it over. In addition, they paid $6M for a building that had $20M owed on it. That spells a $14M loss to my least favorite bank in the history of the world... thanks for making my day! Thu, Feb 2, 2012 : 1:09 p.m. I'm employed and would happily rent one of these units if they were charging a reasonable rate. Unfortunately, &quot;charging a reasonable rate&quot; to steady renters doesn't seem to occur to most Ann Arbor property owners as a way to make money. Fri, Feb 3, 2012 : 1:01 a.m.
Thu, Feb 2, 2012 : 12:07 p.m.
Have to agree with Grumpy. This building is ugly on the outside, and rebranding won't fix that. Whoever built it didn't know or care that Ann Arbor likes character, and a building that looks like a converted Comfort Inn is going to rent only at a big discount. Thu, Feb 2, 2012 : 11:17 a.m.
New awnings = lipstick on a pig. The architect of this building should lose his/her license. Fri, Feb 3, 2012 : 3 a.m.
Kara, have you been to Plymouth, it's really quite nice, and Milford is much improved over the last decade, or two. Both towns are on the up &amp; up, where-as Ann Arbor has been stagnant for years, and it's not all Pfizers fault. Besides, we were talking architecturally, not populationally (I made that word up), so for this conversation, population doesn't matter, but we still have crappy architecture! Thu, Feb 2, 2012 : 6:42 p.m.
@David: Why would AA want to aspire to be like Plymouth or Miford, towns a fraction of the size and not noted for their vibrant character anyway? People may like them, but if population is any measure, not that many of them (relative to AA). If we have to pick another city to aspire to be like, let's reach upward, not backward. Thu, Feb 2, 2012 : 5:10 p.m. Yes, the architect should lose his license, because the building does not resemble the crappy little detached-garage frame dwellings that the old west siders love so much. Thu, Feb 2, 2012 : 4:58 p.m.
@halfright: &quot;Part of living in a free society is enduring the poor taste of your fellow citizens.&quot; Antoni Gaudi would surely agree, not that 111 N. Ashley is any architectural marvel. Many people here, and on previous threads regarding architecture in Ann Arbor are of the opinion that there is no architectural vision, ironically, in a town hosting the A. Alfred Taubman School of Architecture. What would &quot;aesthetic Fascism&quot; look like? Would it mean that all new architecture would be modeled after Hill Auditorium, Bell Tower Inn, and Michigan Theater? I could get used to that! Or would it just mean that Ann Arbor would be as architecturally cohesive as, say, Plymouth, or Milford, MI? Maybe those towns are run by Fascists, I don't know, but most people appreciate the feel of those places. So, if a person were a free-society-idealist, do the simply tolerate bad architecture, or do the move to Plymouth. Please advise. Thu, Feb 2, 2012 : 3:33 p.m.
Amazed at the number of aesthetic fascists in Ann Arbor. No, it's not the role of government to regulate the aesthetics of architecture, any more than to regulate the playbill at Performance Network. Part of living in a free society is enduring the poor taste of your fellow citizens. Although its structure certainly looks sound, I agree that it fell short in trying to blend it with the character of the architecture of this city. I have nothing against progress as it can bring better structures, better planned spaces that are more in agreement with our current life style. However, the aesthetic of the building on the outside is cold and sterile. Regrettably it cannot be changed now...The one good thing is that it has its own parking. Doing otherwise would have been irresponsible given the terrible parking situation in our growing downtown Ann Arbor. Thu, Feb 2, 2012 : 1:46 p.m.
&quot;We deserve better&quot; Why? When did you purchase the building? Thu, Feb 2, 2012 : 1:42 p.m. Yes, I think if I paid $6M for this building, I would then put $10M worth of lipstick into it, that should make a bit of a difference. For $10M you could probably remove the faux brick face and replace it with real hand-laid brick, for example. We deserve better! Thu, Feb 2, 2012 : 1:07 p.m.
Thu, Feb 2, 2012 : 12:36 p.m.
Why should the architect lose their license? Is it structurally faltered? Has the design violated ordinances or safety practices?